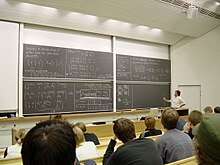 Students attend a lecture at a tertiary institution, Helsinki University of Technology. Tertiary education, also referred to as third stage, third level, and postsecondary education, is the educational level following the completion of a school providing a secondary education. The World Bank, for example, defines tertiary education as including universities as well as trade schools and colleges. Higher education is taken to include undergraduate and postgraduate education, while vocational education beyond secondary education is known as further education in the United Kingdom, or continuing education in the United States. The UNESCO stated that tertiary education focuses on learning endeavors in specialized fields. It includes academic and higher vocational education. The World Bank's 2019 World Development Report on the future of work  argues that given the future of work and the increasing role of technology in value chains, tertiary education becomes even more relevant for workers to compete in the labor market. "Tertiary education" includes further education (FE), as well as higher education (HE). Since the 1970s specialized FE colleges called “tertiary colleges” have been set up to offer courses such as A Levels, that allow progression to HE, alongside vocational courses. An early example of this which expanded in September 1982 as part of a reorganization of education in the Halesowen area which also saw three-tier education axed after just 10 years in force. In some areas where schools do not universally offer sixth forms, tertiary colleges function as a sixth form college as well as a general FE college. Unlike sixth form colleges, the staff join lecturers' rather than teachers' unions. Under devolution in the United Kingdom, education is administered separately in England, Wales, Northern Ireland and Scotland. In 2018 the Welsh Government adopted the term "tertiary education" to refer to post-16 education and training in Wales. Within Australia "Tertiary Education" refers to continuing studies after a students Higher School Certificate. It also refers to any education a student receives after final compulsory schooling, which occurs at the age of 17 within Australia. Tertiary Education options include University, TAFE or private colleges. The higher education system in the United States is decentralized and essentially independent from regulation by the federal government. It is diverse because there are private and public institutions. Some are small and affiliated with religious organizations. Others could be secular, rural, urban, or suburban. In short, there are a wide variety of options which are often locally determined. The United States Department of Education presents a broad-spectrum view of tertiary education and detailed information on the nation's educational structure, accreditation procedures, and connections to state as well as federal agencies and entities. The Carnegie Classifications of Institutions of Higher Education provides an explanation so people will understand how American institutions of higher learning compare to each other. The Carnegie platform separates all accredited schools that give out degrees into categories that describe highest degree granted or special areas of study. US tertiary education includes various non-profit organizations promoting professional development of individuals in the field of higher education and helping expand awareness of related issues like international student services and complete campus internationalization. Although tertiary education in the EU includes university, it can differ from country to country. Along with IUT and STS, Universities (French: Universités) are tertiary educations. After going to Elementary school (French: École maternelle), Primary school (French: École primaire), College (French: Collège), and Lycee (French: Lycée), a student may go to university, but may also retire at that point. ^ "Tertiary Education". World Bank. Retrieved 9 December 2017. ^ "Tertiary education (ISCED levels 5 to 8)". uis.unesco.org. Retrieved 2 July 2018. ^ Lambert, Tim. "A Brief History of Dudley, England". A World History Encyclopedia. Retrieved 15 September 2011. ^ "Welsh Government | Written Statement - Public Good and a Prosperous Wales – Next steps". gov.wales. Retrieved 7 June 2018. ^ "National Center for Education Statistics (NCES) Home Page, part of the U.S. Department of Education". nces.ed.gov. Retrieved 2 July 2018. ^ "IU research Center to House Carnegie Classification of Institutions of Higher Education | Carnegie Foundation for the Advancement of Teaching". Carnegie Foundation for the Advancement of Teaching. 7 October 2014. Retrieved 2 July 2018. ^ "Understanding U.S. Higher Education". EducationUSA. 8 January 2015. Retrieved 2 July 2018. ^ "The American Council on Education". www.acenet.edu. Retrieved 2 July 2018. Brick, Jean (2006). "What is academic culture?". Academic Culture: A Student's Guide to Studying at University. Sydney, N.S.W: National Centre for English Language Teaching and Research. pp. 1–10. ISBN 978-1-74138-135-1.